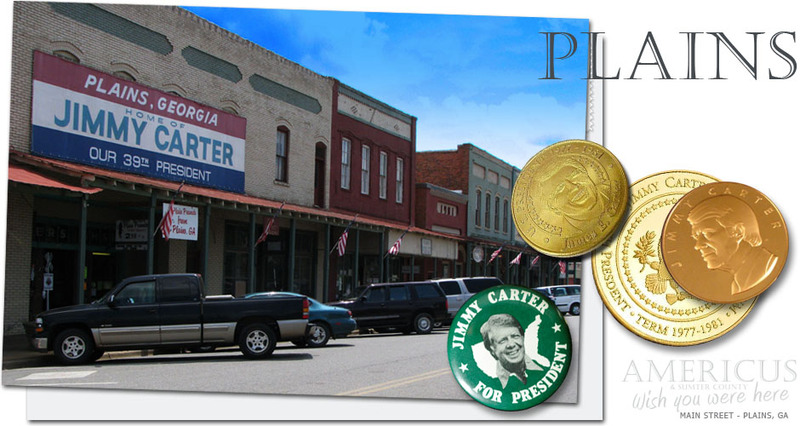 Plains is a quiet, peaceful small town with business as usual and smaller numbers of tourist visiting the hometown of Jimmy Carter and to see this little southern town where a young boy grew up to become the 39th President of the United States. The rural southern culture of Plains that revolves around farming, church and school had a large influence in molding Mr. Carter’s character and in shaping his political policies. Located in Southwest Georgia among the pine trees, peanut fields, magnolias, and gnats is Plains, Georgia, USA. With a population of 683, Plains is situated in one of the state’s most lucrative farming regions. At first glance, one would think it was Dodge City of a century ago. But one is convinced it is not upon hearing that soft Southern drawl lilting in the air. It used to be called “The Plains of Dura”, the name coming from the Bible. The book of Daniel states that Nebuchadnezzar set up a golden image upon the “Plain of Dura”. In any event, the town is situated on a broad plain and one occasionally still hears an old timer refer to the hamlet as “The Plains”. The town is both old and new. It existed in the 1840’s but was not established on its present site until the 1880’s. When the Seaboard Railroad came through the area in the late nineteenth century, a depot was built and the people flocked to it, relocating their town.